Pavey Electricals Ltd offers a comprehensive electrical service for both domestic and commercial properties. Our electricians are fully qualified, insured and licensed to carry out all the work from start to finish. As the top rated electrician in Kent, we’re happy to provide free, no obligation quotes on all rewiring jobs. We always try to work around a date and time that is convenient for you and are happy to work on your premises with verbal consent. When Should I get My House Rewired? Electrical experts recommend that houses should receive a full rewire every 25 to 30 years to ensure the electrical safety is ensured throughout the house or property. We also fully recommend that you should get your house rewired before starting any other major decoration work such as wallpapering, painting or plastering. The work could commence simultaneously with any plumbing work that needs to be undertaken on your property. We recommend these steps due the fact that electrical cables cannot be mounted above board. As a result, we would need to lift the property’s floorboards up and lay cable throughout where appropriate. How Would I Know if My House Has Been Rewired? There are several ways of finding out when your property last received a rewiring. Checking your fuse box (also known as a consumer unit) for this information would be the first port of call. If this doesn’t provide any details as to when the last rewiring was completed, you may be able to source some exposed cabling nearby which may give an indication. 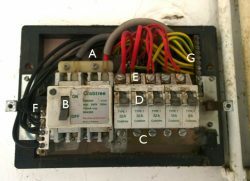 If the consumer unit (fuse box) contains old styled parts or looks similar to the image below, then there is a strong possibility that your property needs a full rewire with a new consumer unit. To deliver the best possible service to our customers, we also offer a service specifically dedicated to surveying a property for rewiring purposes. This type of service is aimed for people that are unsure whether they need an electrical rewiring solution but would like to receive honest advice on what the next steps to take. Rest assured that our electricians will only provide feedback on genuine advice that they feel meets your very best interests and providing you with the most cost-effective solution possible. Why Should I Get A Get A Rewire? As previously mentioned, the number one priority is to ensure safety standards. However other benefits to getting your house rewired consists of making sure that your electrical needs for the future are sustainable. With all the modern-day technology moving into the average household and commercial properties, we expect these demands to increase over the next few decades ahead. The introduction to new smart lighting options, LED bulbs and further electrical appliances mean we need to prepare to expand our electrical needs. We fully recommend that anyone attempting to rewire themselves have sufficient qualifications, knowledge and experience in the electrical industry. Rewiring a property incurs great risk if you’re not an accredited electrician. If you are seeking an electrician in Bexley to rewire your house or property, you can receive the best recommendations on your steps forward to renovating your house or property.